Home is comfort, and all of those other vague, cozy-fuzzy ideas. Home is also the whoosh and gurgle of a running dishwasher late at night in a darkened kitchen. Home is soaking coats dripping themselves dry in a laundry room after a day in the snow. Home is worn, hardwood floors. Home is dents and scratches on corners leftover from plastic trucks and cars that have long since been given away. Home is toast and hot cocoa on Sunday evenings. Home is bookshelves full of loved Dickens and Shakespeare. Home is wooden kitchen chairs that creak and wobble, but somehow stay in one piece. Home is Christmas trees, and candles, and flowers on the table. Home is freshly baked French bread, sliced with butter melting slowly into it. Home is those simple, mundane sounds and smells that are forever connected to happy memories. The house that I grew up in will always have a special place in my heart – it’ll always represent a special, idyllic version of “home,” no matter how many other places I grow to call home throughout my life. 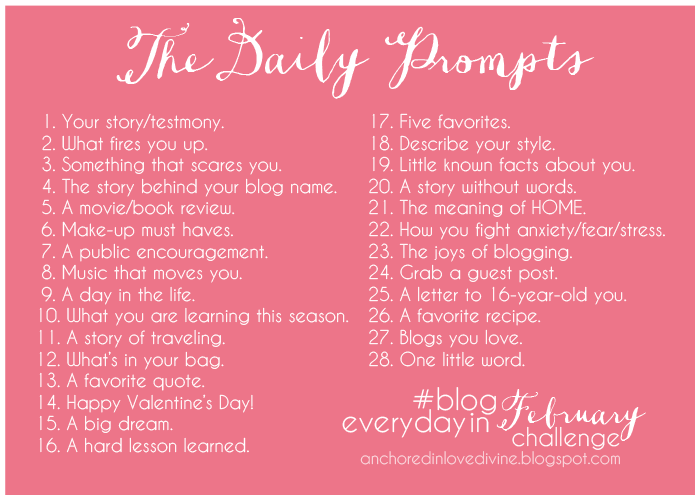 If you’re a blogger, feel free to join in on #blogeverydayinFEB! yesterday morning i came across a beautiful post by allison on her blog, writtenword87, that has stuck with me since i read it. 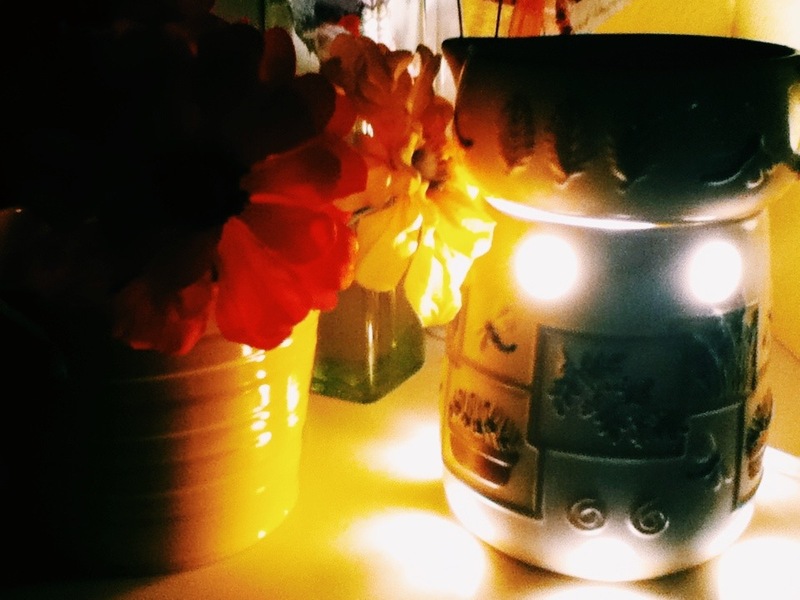 allison wrote about the wonder of memories and about our fascination with items from the past. (click either of the links above and go read it!) when i read her post, i was inspired to dig out my own little stash of memories. on my closet shelf sits an old, white, paper gift bag that is chock full of little bits of the past. this evening i removed it from that location, where it wasn’t doing much but gathering dust, and took a peek inside. i’ll always be a little bit of a pack rat deep down, and it kills me to deep clean my room and have to go through little odds and ends and decide what to keep and throw away. during one such deep-cleaning episode a number of years ago, i had the bright idea to save some of those memory-filled items in a specific location so they wouldn’t pile up on my dresser or my bookshelf or my headboard anymore, but i so could still keep them. since then, i’ve filled my paper gift bag with all sorts of lovely things. going through that bag this evening was like paying a visit to many of the happy memories of my life. there is something so truly beautiful in holding something that has meaning and magic woven through it. i found letters of whimsy and appreciation and thanks and love – and some a combination of all four – from people i cherish. i found photographs where i am standing in the midst of ladies i dearly love, reminding me of sweet summers past. 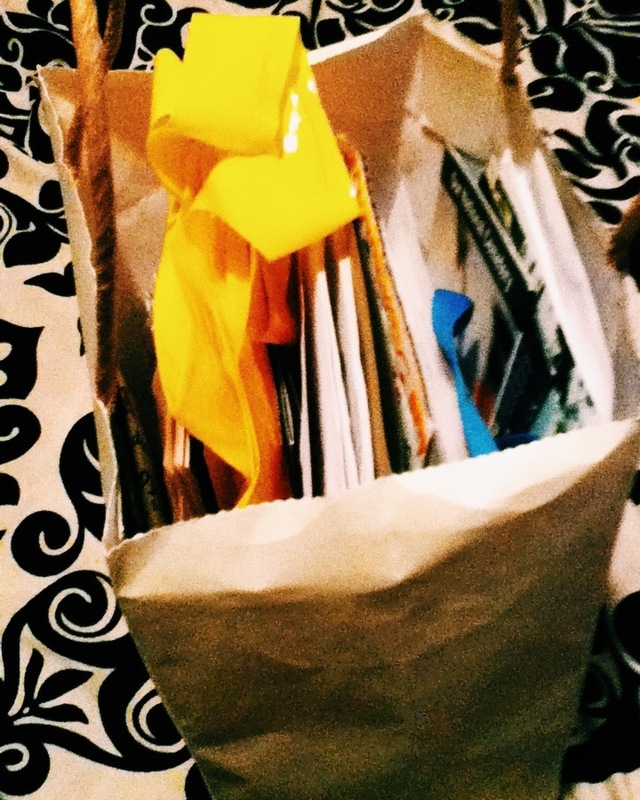 i found a plethora of artifacts from my truly life-altering new york city trip – a lanyard, a photograph from the empire state building, a receipt from an airport on the way home, a phantom of the opera playbill, and a bright yellow plastic bag that once held the play-going outfit i purchased from the forever 21 in times square, to name a few. i found cds with pictures and i found postcards from traveling grandparents. i found books full of campfire songs, crumpled and dirt-streaked, relics of warm weeks full of laughter and sleeping bags and altogether-too-much sugar. 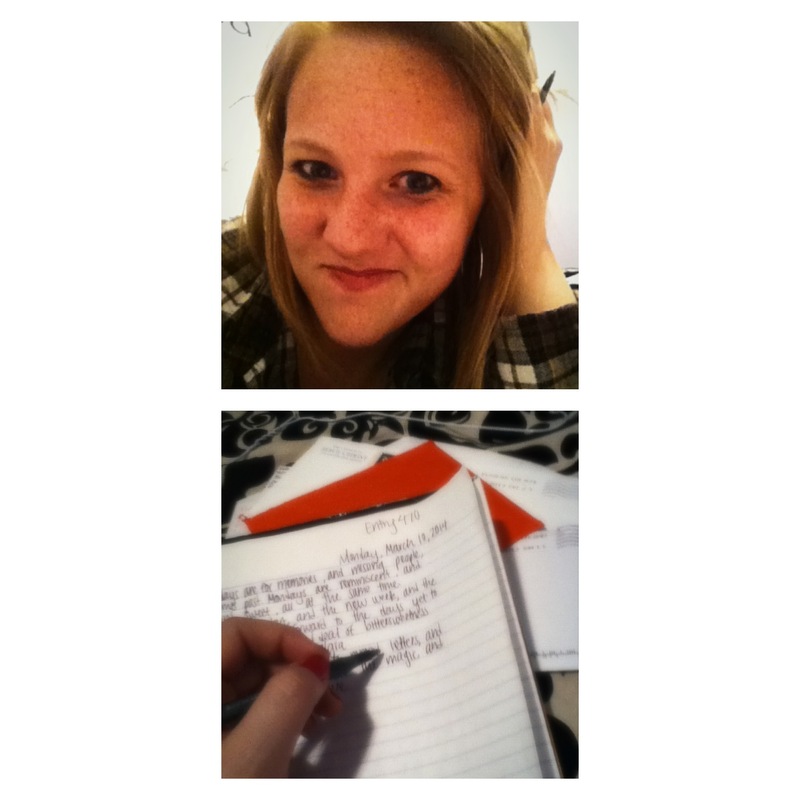 i found memories upon memories that have sat in my closet for so long, just begging to be relieved. apart from my closet stash, i have various bits and pieces of memories paperclipped and glued to journal pages – little things that make my heart smile as i flip through those notebooks of past word-ramblings – two old ticket stubs from a favorite date to a wintry lit-up garden, a copy of the first letter i wrote to a far-away friend, play tickets, letters composed to myself during dull classes, and other such scraps. i am a self-professed lover of words, but somehow reading journaled thoughts doesn’t have quite the same effect as looking through my memory collection. the words are precious, but the experience is entirely different from discovering tangible treasures. what is it that allures to us through those physical objects that we are so attached to – those items that are virtually valueless to the rest of the world, but are so priceless to our hearts? if there’s any magic in the world, i believe that those items must certainly possess some of it. we long to hold something tangible in our hands, to smooth out bent and wrinkled letters, to connect the here and now to a wonderful past, to prove to ourselves that those breathtaking, forever-sparkling happenings really occurred, to reminisce on good times gone that will be forever fairy-dusted and sparkling in our thoughts. we’re drawn to the reality of a gleaming past, to the evidence of happiness, to the substance of memories. where (or when) have you found the magic of memories in tangible form?